Fabrisonic was part of a study that was recently published in the American Welding Society Welding Journal. The title of the article is “Effects of Ultrasonic Power on the Hardness of Aluminum 3003-H18 Alloy”. Fabrisonic’s SonicLayer 7200 was a big part of the experiment. The article touches on the impact of changing amplitudes and how it affects hardness. To read the article in depth, go to the link WELDING. The link will take you to the AWS site where you can find out how to obtain the story. For more information on Fabrisonic, click HERE. Engineering.com recently wrote an article about Fabrisonic that covers our unique capabilities. The article talks about our Ultrasonic Additive Manufacturing process and how we have intertwined it with the CNC for a hybrid additive/subtractive process. In addition to the features, Fabrisonic’s CEO, Mark Norfolk was also interviewed for the piece. He touches base on the process and the future of the company. The article has a great overview of the company and even mentions the ongoing projects with NASA to continue to learn about this new technology. To read the entire article, click ENGINEERING. For more information about Fabrisonic can offer, click HERE. How does Fabrisonic’s 3D printing differ from other metal additive manufacturing processes? Isn’t UAM just another powder bed printer? Click HERE for a depiction of the differences between Ultrasonic Additive Manufacturing (Fabrisonic’s method), Powder Bed Fusion, and Directed Energy Deposition. For each metal additive technique, the infographic provides a brief description and some characteristics of each. Confused? Need more information? — contact us directly by calling 614.688.5197 or shooting us an email at info@fabrisonic.com. Our engineers have in depth knowledge of all metal 3D printing processes and can help you identify the right process for your part. Fabrisonic recently worked with researchers at NASA to test ultrasonic 3D printing as a method for embedding fiber optics into solid metal. 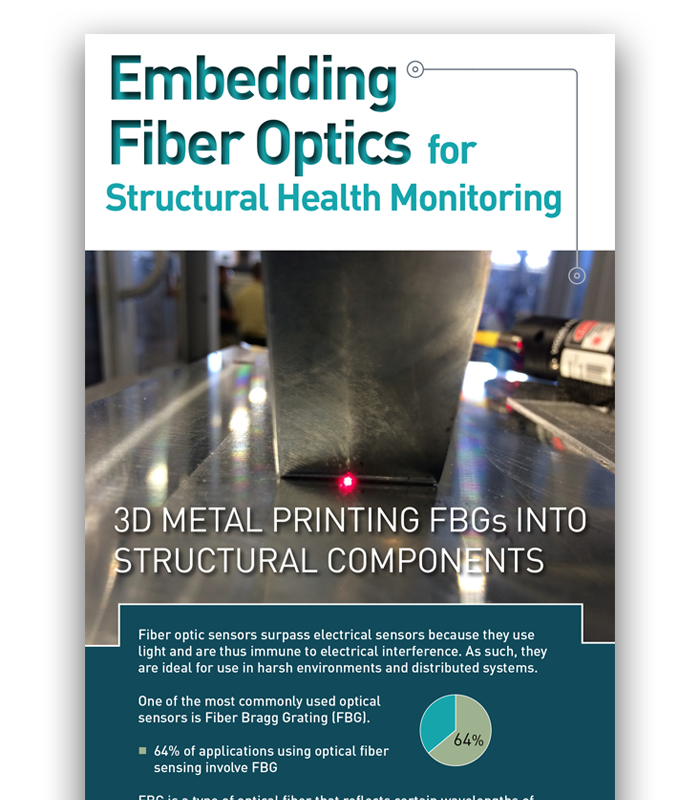 Fabrisonic’s new infographic, Embedding Fiber Optics for Structural Health Monitoring, illustrates more about the project and the ultrasonic additive manufacturing process. Last week Fabrisonic had the opportunity to present to a group of Ohio manufacturers through the Wire-Net lunch and learn series. Mark Norfolk, our President & CEO, talked about Fabrisonic’s journey from great idea to successful startup (hey, we are still here after five years). There was a wide variety of manufacturer’s represented and the conversation was great to hear. In particular the attendees were inquisitive about how 3D printing is going to effect their business in the long term. There was also a lot of conversation on how current manufacturers can get involved with metal 3D printing. Another interesting topic that came up was training of students. Several manufacturers wanted to understand how new people coming into the workforce can learn about 3D printing and be ready to integrate it into other operations. Fabrisonic is delighted that Ohio manufacturers are so forward thinking in preparing for new technologies. Find out more how 3D metal printing can help bring your ideas to life. Fill out a request form and our experts will follow up with you soon.